The University of Hawai’i Rainbow Warrior basketball team will host its annual awards banquet Wednesday, April 25, at the Hilton Hawaiian Village Tapa Ballroom. No host cocktails will begin at 5:30 p.m. with dinner and the evening’s program to follow, beginning at 6:30 p.m. Admission price is $100 per person, and all fans are invited to purchase tickets. Group tables are also available for purchase. CLICK HERE for an order form that can be returned to the UH basketball office. For best seating, return the form by April 18. For more information, contact Bobbie Omoto at 956-6501. UH concluded the 2011-12 season with a 16-16 record, highlighted by the team’s first win over a ranked team (#14 Xavier) in seven years. 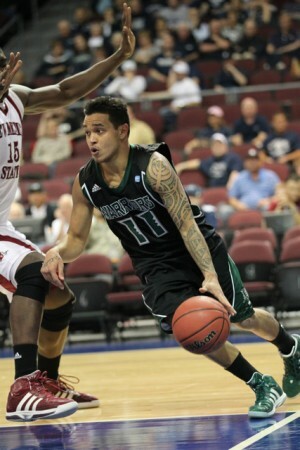 In its 33d and final season in the Western Athletic Conference, the ‘Bows won their first WAC Tournament game in seven years and advanced to the semifinals for the first time in nearly a decade.